Meridian Ocean Services is an international marine services provider. The fast-growing company leverages the latest in Remotely Operated Vehicles (ROVs), Autonomous Underwater Vehicles (AUVs) and advanced imaging technology to optimise clients’ undersea survey and inspection efforts across a variety of industries worldwide. Meridian is a leader in ROV-performed underwater inspections in lieu of drydocking (UWILD) for drillships, jackup rigs, FPSOs and other working vessels. These inspections are largely performed while the assets remain operational. Implementing Meridian ROVs for these inspections, which consist of both hull and ballast tank surveys, reduces downtime and the level of support required from other vessels. Meridian’s ballast tank inspection UWILD process eliminates the need for marine chemists and significantly lowers the time associated with tank inspections. The company also performs UWILD vessel inspections. With a primary focus on ROV-based Inspection, Repair and Maintenance (IRM) and subsea surveys, Meridian operates and supplies a fleet of subsea vehicles, ranging from efficient, inspection-class vehicles to work-class ROVs (WROVs) for demanding tasks. Meridian provides larger WROV systems capable of deep water construction and drilling support, and the company’s inspection-class ROVs require a minimal vessel platform footprint and are quickly and easily deployed. Meridian implements ROVs, AUVs, divers and other tools to address industry-specific survey and inspection requirements. The company’s fleet of vehicles is available for rapid deployment worldwide. Meridian’s easily-mobilised ROVs efficiently and effectively perform tasks in support of the offshore industry, often while a rig remains fully functional. Meridian’s ROVs can be equipped with high-definition cameras to directly observe and record pipeline touchdown points (TDP) in real-time. This enables operators to identify obstacles before and during the pipe laying process and confirm the pipe is in good condition prior to its installation on the sea floor, avoiding costly and timely issues. The company’s ROVs also assist in pre-drilling site surveys by confirming well surface drilling locations and identifying potential seafloor hazards (such as reefs, pinnacles and rock outcrops), man-made hazards (shipwrecks, communication and power cables, well heads and miscellaneous debris) and geological hazards (faults, erosion and buried channels). With these tools, the company’s ROVs inspect structures for degradation or loss of integrity. In addition, Meridian’s ROVs can be equipped with multibeam echo-sounders, which portray highly accurate pictures of the structure or seafloor. ROVs and imaging can assist in the installation and monitoring of undersea cables using multi-level video inspection, as well as provide valuable information on the proposed cable positioning and the post-lay cable location. Meridian supplies small ROVs that are ideal for performing visual inspections for leaks, cracks, weak spots, and erosion on bulkheads both in ships and sea walls. Additionally, ROVs also identify and remove potentially harmful debris from busy shipping channels and harbours before they create accidents. Smaller ROVs can be transported and deployed by a single person, enabling security sweeps of ship hulls, piers and bridges to be performed quickly and accurately. They can be used alongside or independent of dive teams to locate and remove drugs and contraband from ship hulls and other underwater infrastructure. 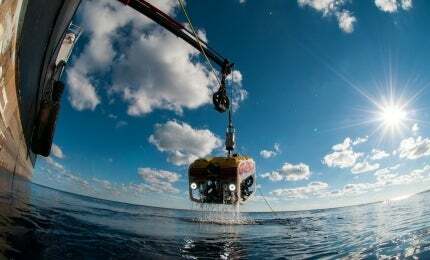 Meridian’s ROVs evaluate potential new artificial reef locations, as well as monitor the health of both artificial and natural reefs. High-definition video recording and still images taken by the company’s ROVs help record and compare basic attributes of a reef, such as fish population and the overall stability of the actual reef infrastructure. ROVs and AUVs are leading the new trend of oceanographic research as they work longer, smarter and more efficiently in deeper sea depths. They are also capable of exploring areas too dangerous or deep for divers, opening up the opportunity to investigate more archaeological sites. Moran Environmental Recovery (MER) and Meridian Ocean Services (Meridian) announced today that they have entered into a strategic partnership agreement. Meridian Ocean Services believes a fleet orientation, as opposed to an asset orientation, has the potential to drive down costs, increase standardisation and enhance safety.